Major operations at La Trinidad, Rama highway, and Siunalatisha and La Bonanza. Numerous government bases overrun throughout Jinotega, Matagalpa, Zelaya Norte, Zelaya Sur, Chontales, and Rio San Juan provinces. During their war against the Nicaraguan government, the Contras committed a large number of human rights violations and used terrorist tactics. These actions were frequently carried out systematically as a part of the strategy of the Contras. Supporters of the Contras tried to downplay these violations, particularly the Reagan administration in the US, which engaged in a campaign of white propaganda to alter public opinion in favor of the contras, while covertly encouraging the Contras to attack civilian targets. From an early stage, the rebels received financial and military support from the United States government, and their military significance decisively depended on it. After US support was banned by Congress, the Reagan administration covertly continued it. These illegal activities culminated in the Iran–Contra affair. The term "contra" comes from the Spanish contra, which means against but in this case is short for la contrarrevolución, in English "the counter-revolution". The US government viewed the leftist Sandinistas as a threat to economic interests of American corporations in Nicaragua and to national security. US President Ronald Reagan stated in 1983 that "The defense of [the USA's] southern frontier" was at stake. "In spite of the Sandinista victory being declared fair, the United States continued to oppose the left-wing Nicaraguan government." and opposed its ties to Cuba and the Soviet Union. Ronald Reagan, who had assumed the American presidency in January 1981, accused the Sandinistas of importing Cuban-style socialism and aiding leftist guerrillas in El Salvador. The Reagan administration continued to view the Sandinistas as undemocratic despite the 1984 Nicaraguan elections being generally declared fair by foreign observers. Throughout the 1980s the Sandinista government was regarded as "Partly Free" by Freedom House, an organization financed by the U.S. government. On 1 May 1985 President Reagan announced that his administration perceived Nicaragua to be "an unusual and extraordinary threat to the national security and foreign policy of the United States", and declared a "national emergency" and a trade embargo against Nicaragua to "deal with that threat". It "is now a given; it is true", the Washington Post declared in 1986, "the Sandinistas are communists of the Cuban or Soviet school"; that "The Reagan administration is right to take Nicaragua as a serious menace—to civil peace and democracy in Nicaragua and to the stability and security of the region"; that we must "fit Nicaragua back into a Central American mode" and "turn Nicaragua back toward democracy," and with the "Latin American democracies" "demand reasonable conduct by regional standard." It was alarming that in just a few months after the Sandinista revolution, Nicaragua received international acclaim for its rapid progress in the fields of literacy and health. It was alarming that a socialist-mixed-economy state could do in a few short months what the Somoza dynasty, a U.S. client state, could not do in 45 years! It was truly alarming that the Sandinistas were intent on providing the very services that establish a government's political and moral legitimacy. The government's program included increased wages, subsidized food prices, and expanded health, welfare, and education services. And though it nationalized Somoza's former properties, it preserved a private sector that accounted for between 50 and 60 percent of GDP. The victim dug his own grave, scooping the dirt out with his hands... He crossed himself. Then a contra executioner knelt and rammed a k-bar knife into his throat. A second enforcer stabbed at his jugular, then his abdomen. When the corpse was finally still, the contras threw dirt over the shallow grave — and walked away. The CIA officer in charge of the covert war, Duane "Dewey" Clarridge, admitted to the House Intelligence Committee staff in a secret briefing in 1984 that the Contras were routinely murdering "civilians and Sandinista officials in the provinces, as well as heads of cooperatives, nurses, doctors and judges". But he claimed that this did not violate President Reagan's executive order prohibiting assassinations because the agency defined it as just 'killing'. "After all, this is war—a paramilitary operation," Clarridge said in conclusion. Edgar Chamorro explained the rationale behind this to a U.S. reporter. "Sometimes terror is very productive. This is the policy, to keep putting pressure until the people cry 'uncle'". The CIA manual for the Contras, Tayacan, states that the Contras should gather the local population for a public tribunal to "shame, ridicule and humiliate" Sandinista officials to "reduce their influence". It also recommends gathering the local population to witness and take part in public executions. These types of activities continued throughout the war. After the signing of the Central American Peace Accord in August 1987, the year war related deaths and economic destruction reached its peak, the Contras eventually entered negotiations with the Sandinista government (1988), and the war began to deescalate. By 1989 the US backed Contra war and economic isolation had inflicted severe economic suffering on Nicaraguans. The US government knew that the Nicaraguans had been exhausted from the war, which had cost 30,865 lives, and that voters usually vote the incumbents out during economic decline. By the late 1980s Nicaragua's internal conditions had changed so radically that the US approach to the 1990 elections differed greatly from 1984. The Bush administration decided to promote an opposition victory and to denounce the country's electoral laws and procedures should there be a Sandinista victory. The United States, through the National Endowment for Democracy, organized a united opposition out of fourteen dissimilar microparties into the National Opposition Union (Unión Nacional Oppositora, UNO). It promoted their candidates including presidential nominee Violeta Chamorro who was received by President Bush at the White House. The US thus "micromanaged the opposition" and exerted massive external pressure on the electorate. The Contra war escalated over the year before the election. The US promised to end the war and the economic embargo should she win. The UNO scored a decisive victory on 25 February 1990. Chamorro won with 55 percent of the presidential vote as compared to Ortega's 41 percent. Of 92 seats in the National Assembly, UNO gained 51, and the FSLN won 39. On 25 April 1990, Chamorro assumed presidency from Daniel Ortega. With Congress blocking further contra aid, the Reagan administration sought to arrange funding and military supplies by means of third countries and private sources. Between 1984 and 1986, $34 million from third countries and $2.7 million from private sources were raised this way. The secret contra assistance was run by the National Security Council, with officer Lt. Col. Oliver North in charge. With the third-party funds, North created an organization called The Enterprise, which served as the secret arm of the NSC staff and had its own airplanes, pilots, airfield, ship, operatives, and secret Swiss bank accounts. It also received assistance from personnel from other government agencies, especially from CIA personnel in Central America. This operation functioned, however, without any of the accountability required of U.S. government activities. The Enterprise's efforts culminated in the Iran–Contra Affair of 1986–1987, which facilitated contra funding through the proceeds of arms sales to Iran. According to the London Spectator, U.S. journalists in Central America had long known that the CIA was flying in supplies to the Contras inside Nicaragua before the scandal broke. No journalist paid it any attention until the alleged CIA supply man, Eugene Hasenfus, was shot down and captured by the Nicaraguan army. Similarly, reporters neglected to investigate many leads indicating that Oliver North was running the Contra operation from his office in the National Security Council. The Reagan administration's support for the Contras continued to stir controversy well into the 1990s. In August 1996, San Jose Mercury News reporter Gary Webb published a series titled Dark Alliance, alleging that the contras contributed to the rise of crack cocaine in California. If you're talking about our intelligence community tolerating — if not promoting — drugs to pay for black ops, it's rather an uncomfortable thing to do when you're an establishment paper like the Post. If you were going to be directly rubbing up against the government, they wanted it more solid than it could probably ever be done. An investigation by the United States Department of Justice also stated that their "review did not substantiate the main allegations stated and implied in the Mercury News articles." Regarding the specific charges towards the CIA, the DOJ wrote "the implication that the drug trafficking by the individuals discussed in the Mercury News articles was connected to the CIA was also not supported by the facts." The CIA also investigated and rejected the allegations. During the time the US Congress blocked funding for the contras, the Reagan government engaged in a campaign to alter public opinion and change the vote in Congress on contra aid. For this purpose, the NSC established an interagency working group, which in turn coordinated the Office of Public Diplomacy for Latin America and the Caribbean (managed by Otto Reich), which conducted the campaign. The S/LPD produced and widely disseminated a variety of pro-contra publications, arranged speeches and press conferences. It also disseminated "white propaganda"—pro-contra newspaper articles by paid consultants who did not disclose their connection to the Reagan administration. On top of that, Oliver North helped Carl Channell's tax-exempt organization, the National Endowment for the Preservation of Liberty, to raise $10 million, by arranging numerous briefings for groups of potential contributors at the premises of the White House and by facilitating private visits and photo sessions with President Reagan for major contributors. Channell in turn, used part of that money to run a series of television advertisements directed at home districts of Congressmen considered swing votes on contra aid. Out of the $10 million raised, more than $1 million was spent on pro-contra publicity. In 1984 the Sandinista government filed a suit in the International Court of Justice (ICJ) against the United States (Nicaragua v. United States), which resulted in a 1986 judgment against the United States. The ICJ held that the U.S. had violated international law by supporting the contras in their rebellion against the Nicaraguan government and by mining Nicaragua's harbors. 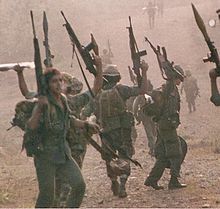 Regarding the alleged human rights violations by the contras, however, the ICJ took the view that the United States could be held accountable for them only if it would have been proven that the U.S. had effective control of the contra operations resulting in these alleged violations. Nevertheless, the ICJ found that the U.S. encouraged acts contrary to general principles of humanitarian law by producing the manual Psychological Operations in Guerrilla Warfare (Operaciones sicológicas en guerra de guerrillas) and disseminating it to the contras. The manual, amongst other things, advised on how to rationalize killings of civilians and recommended to hire professional killers for specific selective tasks. U.S. news media published several articles accusing Americas Watch and other bodies of ideological bias and unreliable reporting. It alleged that Americas Watch gave too much credence to alleged Contra abuses and systematically tried to discredit Nicaraguan human rights groups such as the Permanent Commission on Human Rights, which blamed the major human rights abuses on the Contras. By 1986 the contras were besieged by charges of corruption, human-rights abuses, and military ineptitude. A much-vaunted early 1986 offensive never materialized, and Contra forces were largely reduced to isolated acts of terrorism. In October 1987, however, the contras staged a successful attack in southern Nicaragua. Then on 21 December 1987, the FDN launched attacks at La Bonanza, La Siuna, and La Rosita in Zelaya province, resulting in heavy fighting. ARDE Frente Sur attacked at El Almendro and along the Rama road. These large-scale raids mainly became possible as the contras were able to use U.S.-provided Redeye missiles against Sandinista Mi-24 helicopter gunships, which had been supplied by the Soviets. Nevertheless, the Contras remained tenuously encamped within Honduras and were not able to hold Nicaraguan territory. There were isolated protests among the population against the draft implemented by the Sandinista government, which even resulted in full-blown street clashes in Masaya in 1988. However, a June 1988 survey in Managua showed the Sandinista government still enjoyed strong support but that support had declined since 1984. Three times as many people identified with the Sandinistas (28%) than with all the opposition parties put together (9%); 59% did not identify with any political party. Of those polled, 85% opposed any further US aid to the Contras; 40% believed the Sandinista government to be democratic, while 48% believed it to be not democratic. People identified the war as the largest problem but were less likely to blame it for economic problems compared to a December 1986 poll; 19% blamed the war and US blockade as the main cause of economic problems while 10% blamed the government. Political opposition groups were splintered and the Contras began to experience defections, although United States aid maintained them as a viable military force. After a cutoff in U.S. military support, and with both sides facing international pressure to bring an end to the conflict, the contras agreed to negotiations with the FSLN. With the help of five Central American Presidents, including Ortega, the sides agreed that a voluntary demobilization of the contras should start in early December 1989. They chose this date to facilitate free and fair elections in Nicaragua in February 1990 (even though the Reagan administration had pushed for a delay of contra disbandment). Possible explanations include that the Nicaraguan people were disenchanted with the Ortega regime as well as the fact that already in November 1989, the White House had announced that the economic embargo against Nicaragua would continue unless Violeta Chamorro won. Also, there had been reports of intimidation from the side of the contras, with a Canadian observer mission claiming that 42 people were killed by the contras in "election violence" in October 1989. This led many commentators to conclude that Nicaraguans voted against the Sandinistas out of fear of a continuation of the contra war and economic deprivation. The Americans, the TV series features an episode on KGB agents infiltrating a Contra camp. American Made, a film loosely based on Barry Seal's life. Contra – While it is unclear whether the game was deliberately named after the Nicaraguan Contra rebels, the ending theme of the original game was titled "Sandinista" (サンディニスタ), after the adversaries of the real-life Contras. Contra, the second studio album by the American indie rock band Vampire Weekend, released in January 2010 on XL Recordings. It debuted at number one on the US Billboard 200. The album title is intended as a thematic allegory and a complex reference to the Nicaraguan counter-revolutionaries. The song "I Think Ur a Contra" is from this album. City Hunter, a manga, the main protagonist, Ryo Saeba, was raised as a contra guerilla fighter in Central America. Student Visas, a song by Corb Lund from the album "Horse Soldier! Horse Soldier! ", is about US Clandestine soldiers (such as SFOD-D and CIA Paramilitary) interacting with Contras in El Salvador and Nicargua. Fragile (Sting song)The song is a tribute to Ben Linder, an American civil engineer who was killed by the Contras in 1987 while working on a hydroelectric project in Nicaragua. ^ Greg Grandin; Gilbert M. Joseph (2010). A Century of Revolution. Durham, North Carolina: Duke University Press. p. 89. ISBN 978-0822392859. ^ a b Todd, Dave (26 February 1986). "Offensive by Nicaraguan "Freedom Fighters" May be Doomed as Arms, Aid Dry Up". Ottawa Citizen. Retrieved 27 June 2011. ^ Albert J. Jongman; Alex P. Schmid (1988). Political Terrorism: A New Guide To Actors, Authors, Concepts, Data Bases, Theories, And Literature. Transaction Publishers. pp. 17–18. ISBN 978-1-41280-469-1. Retrieved 27 May 2015. ^ Athan G. Theoharis; Richard H. Immerman (2006). The Central Intelligence Agency: Security Under Scrutiny. Greenwood Publishing Group. p. 216. ISBN 978-0313332821. ^ Fried, Amy (1997). Muffled Echoes: Oliver North and the Politics of Public Opinion. Columbia University Press. pp. 65–68. ISBN 9780231108201. Retrieved 22 April 2015. ^ a b c d John A. Booth; Christine J. Wade; Thomas W. Walker (2014). Understanding Central America: Global Forces, Rebellion, and Change. Avalon Publishing. p. 107. ISBN 9780813349589. ^ Dickey, Christopher. With the Contras, A Reporter in the Wilds of Nicaragua. Simon & Schuster, 1985. ^ Dillon, Sam (1991). Comandos: The CIA and Nicaragua's Contra Rebels. New York: Henry Holt. pp. 49–56. ISBN 978-0-8050-1475-4. OCLC 23974023. ^ Horton, Lynn (1998). Peasants in Arms: War and Peace in the Mountains of Nicaragua, 1979–1994. Athens: Ohio University Center for International Studies. pp. 95–117. ISBN 978-0-89680-204-9. OCLC 39157572. ^ Padro-Maurer, R. The Contras 1980–1989, a Special Kind of Politics. NY: Praeger Publishers, 1990. ^ Brown, Timothy C. The Real Contra War, Highlander Peasant Resistance in Nicaragua. University of Oklahoma Press, 2001. ^ "Contra Organizations: The Contra Story — Central Intelligence Agency". Cia.gov. Retrieved 2014-08-18. ^ a b c Williams, Adam (26 November 2010). "Edén Pastora: A wanted man". The Tico Times. Archived from the original on 15 December 2010. Retrieved 22 May 2011. ^ The Americas Watch Committee. "Human Rights in Nicaragua 1986" (print), Americas Watch, February 1987. ^ John A., Thompson, "The Exaggeration of American Vulnerability: An Anatomy of Tradition," Diplomatic History, 16/1, (1992): p 23. ^ Apple Jr., R. W. (12 March 1986). "Mudslinging over Contras". New York Times. Retrieved 21 September 2017. ^ a b "NSDD – National Security Decision Directives – Reagan Administration". Fas.org. 30 May 2008. Retrieved 17 August 2011. ^ "Nicaragua". Lcweb2.loc.gov. Retrieved 2014-08-18. ^ "BBC ON THIS DAY - 5 - 1984: Sandinistas claim election victory". bbc.co.uk. 1984-11-05. ^ ""The Lessons of Afghanistan", by Michael Johns, Policy Review, March 1987, pp. 32-35". UNZ.org. ^ John A. Booth; Christine J. Wade; Thomas W. Walker (2014). Understanding Central America: Global Forces, Rebellion, and Change. Avalon Publishing. p. 112. ISBN 9780813349589. ^ Kermit D. Johnson (1997). Ethics and Counterrevolution: American Involvement in Internal Wars. University Press of America. p. 19. ISBN 9780761809067. 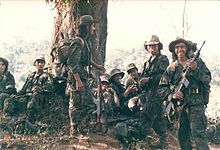 ^ "The Contras did prove adept at carrying out U.S. guerrilla warfare strategies, supplied in the CIA training manuals, which advised them to "neutralize" civilian leaders, incite mob violence and attack "soft" targets such as agricultural cooperatives." Thomas W. Walker (1991). Revolution and Counterrevolution in Nicaragua. Westview Press. p. 335. ISBN 9780813308623. ^ The CIA manual, Tayacan, advises the paramilitaries "to neutralize carefully selected and planned targets, such as court judges etc." In the section entitled, "Implicit and Explicit Terror", the manual states that it is necessary to "kidnap all officials or agents of the Sandinista government" or "individuals in tune with the regime", who then should be removed from the town "without damaging them publicly". As noted in: Holly Sklar (1988). Washington's War on Nicaragua. South End Press. p. 179. ISBN 9780813308623. ^ Holly Sklar (1988). Washington's War on Nicaragua. South End Press. p. 268. ISBN 9780813308623. ^ Mary J. Ruwart (2003). Healing Our World in an Age of Aggression. SunStar Press. p. 309. ISBN 9780963233660. ^ a b John A. Booth; Christine J. Wade; Thomas W. Walker (2014). Understanding Central America: Global Forces, Rebellion, and Change. Avalon Publishing. p. 113. ISBN 9780813349589. ^ "The Contras, cocaine, and covert operations: Documentation of official U.S. knowledge of drug trafficking and the Contras". The National Security Archive / George Washington University. c. 1990. ^ "The Oliver North File". Gwu.edu. Retrieved 17 August 2011. ^ "The Contras, Cocaine, and Covert Operations". gwu.edu. ^ Morrison, Fred L. (January 1987). "Legal Issues in The Nicaragua Opinion". American Journal of International Law. 81 (1): 160–166. doi:10.2307/2202146. JSTOR 2202146. Archived from the original on 5 February 2012. "Appraisals of the ICJ's Decision. Nicaragua vs United State (Merits)"
^ "Human Rights Watch World Report 1993 – Nicaragua". Archived from the original on 9 October 2012. Retrieved 18 September 2009. ^ The Americas Watch Committee (February 1987). "Human Rights in Nicaragua 1986". Americas Watch. ^ New York Times, 23 November 1984. ^ The New Republic, 20 January 1986; The New Republic, 22 August 1988; The National Interest, Spring 1990. ^ David Asman, "Despair and fear in Managua", Wall Street Journal, 25 March 1985. ^ Smolowe, Jill (22 December 1986). "Nicaragua Is It Curtains?". Time Magazine. Retrieved 27 June 2011. ^ "The last major attack, in October along the Rama Road in southern Nicaragua, was considered a success for the guerrillas." As seen at: Lemoyne, James (22 December 1987). "Both Sides Report Heavy Fighting In Rebel Offensive in Nicaragua". New York Times. Retrieved 30 April 2010. ^ a b c Lemoyne, James (22 December 1987). "Both Sides Report Heavy Fighting In Rebel Offensive in Nicaragua". New York Times. Retrieved 30 April 2010. ^ Lemoyne, James (2 February 1988). "Contras' Top Fighter Vows No Letup". New York Times. Retrieved 30 April 2010. ^ Meara, William R. Contra Cross: Insurgency And Tyranny in Central America, 1979–1989. U.S. Naval Institute Press, 2006. ^ Kinzer, Stephen (23 July 1987). "Sandinistas report capture of RedEye Missile". New York Times. Retrieved 30 April 2010. ^ Wicker, Tom (14 August 1989). "Enough Have Died for Nothing in Nicaragua". Wilmington Morning Star. Retrieved 27 June 2011. ^ Ulig, Mark (14 August 1989). "New Regional Accord Leaves Contras in Honduras Fearful but Defiant". New York Times. Retrieved 27 June 2011. ^ "Sometimes they used force as they rounded up young men for military service, and there were occasional confrontations. But only in the town of Masaya, 19 miles southeast of the capital of Managua, did the conscription spark a full-blown street clash...For several weeks before the latest outburst in Masaya, the opposition newspaper, La Prensa, had been reporting isolated protests against the draft." As seen at: Kinzer, Stephen (28 February 1988). "THE WORLD: Nicaragua; Pushed From Left or Right, Masaya Balks". New York Times. Retrieved 30 April 2010. ^ "Sandinistas Surviving in a Percentage Game". Envio. December 1988. ^ "Nicaraguans Try Peace Moves While Waiting for U.S. Voters". Envio. November 1988. ^ "Contra Insurgency in Nicaragua". OnWar.com. December 2000. ^ Uhlig, Mark A. (27 February 1990). "Turnover in Nicaragua; NICARAGUAN OPPOSITION ROUTS SANDINISTAS; U.S. PLEDGES AID, TIED TO ORDERLY TURNOVER". The New York Times. Retrieved 30 April 2010. ^ a b "After the Poll Wars-Explaining the Upset". Envio. March 1990. ^ Ａ－ＪＡＸ～コナミ・ゲーム・ミュージック VOL.4 A-Jax: Konami Game Music Vol. 4 (booklet). G.M.O. Records / Alfa Records. 28XA-201. Gill, Terry D. (1989). Litigation strategy at the International Court: a case study of the Nicaragua v United States dispute. Dordrecht. ISBN 978-0-7923-0332-9.
International Court of Justice (1986) "Military and Paramilitary Activities in and Against Nicaragua (Nicaragua v. United States Of America) – Summary of the Judgment of 27 June 1986". International Court of Justice. Retrieved 20 May 2011.
International Court of Justice (IV) (1986) "Case concerning Military and Paramilitary Activities in and Against Nicaragua (Nicaragua v. United States Of America), Vol. IV – pleadings, oral arguments, documents" (PDF). International Court of Justice. Archived from the original (PDF) on 2 December 2011. Retrieved 2 June 2011. *Hamilton, Lee H. et al. (1987) "Report of the Congressional Committees Investigating the Iran/Contra Affair"